Create lovely, rustic planting containers that will age beautifully in your garden. 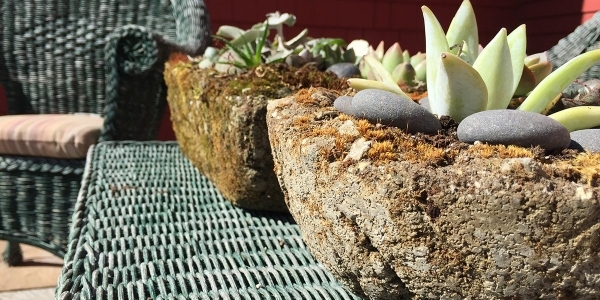 Create rustic, textured planting containers making your own hypertufa mix. Hypertufa is an easy-to-work-with material that mimics rock and ages gracefully, collecting a patina of moss and lichen over time. Fiona will walk you through the ratios for mixing the concrete, choosing and preparing your forms, and molding your planter. The planter will set in the studio for a few days, after which you can pick up your finished work, ready to be planted and placed in your garden! Fiona Davis, Ceramics Director, was born and educated in the UK, where she studied early childhood education and development. She immigrated to the United States with her husband and moved to Vermont in 1988. Fiona first took pottery with Jenny Swanson and worked with her at the League of NH Craftsmen and later at Dartmouth College’s Ceramic Workshops. Fiona was apprenticed to Miranda Thomas at her workshop in Quechee and followed her to Bridgewater, VT, where she worked alongside Ara Cardew. During this time she taught at the ArtPost, started by Caroline Bardos. Fiona came to ArtisTree in 2012 to begin the ceramics program and to help provide outreach opportunities to different communities within the Upper Valley.